Shaggy Bag products provide comfort with the Elastro-Comfort (ECO) foam filled bags. Shaggy Bags never go flat, or need refilling! With four sizes to choose from, you're bound to find the perfect shape of comfort to suit your needs. 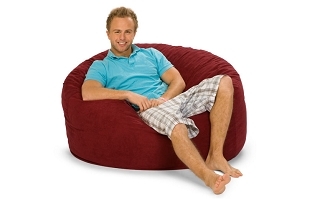 Shaggy Bags vary in size from our 6 foot Goliath foam bean bag chair, large enough to comfortably seat 3 adults, to our Junior foam bean bag chair that is perfect for children to curl up on. Shaggy Bags are perfect for home furniture, office furniture, dorm furniture or anywhere you can use a little comfort. Any room, anytime, anywhere! Shaggy Bag! Shaggy Bags, no matter what size, are the best foam bean bags on the market. When compared to competitors like love sac, luv sacs, lovesacks, or however you want to spell it, there is no doubt ShaggyBags own the market. Side by side the giant foam bean bag chairs are very similar, however it is your wallet that hurts when you have to fork out almost double the cash to purchase a Lovesack. OUCH!!! That is a slap in the face and the wallet. Don't let Lovesacks "inner bag only" price fool you, they will charge you more for a cover. By the time you check out, your cost for the foam bag will be almost double what you would pay for a ShaggyBag. Why pay more for the same thing? Lovesac may try to lure you in with their brand name and marketing, but why take the bait? 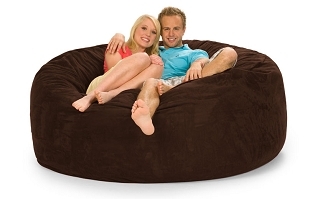 Purchase a ShaggyBag today and start enjoying the giant foam bean bag that is "changing the shape of comfort."